Did you know chinchillas’ are vegetarians? And did you know they have delicate stomachs? Or did you know that chinchillas are coprophagous pets meaning they feed on their droppings. But, don’t panic! This practice is normal and healthy as they get more nutrients from their feces. To help you take care of your chinchillas' we have reviewed 4 best foods for your chinchillas’ available is pet stores. These commercial foods are ideal for your chins as they contain the correct amount of fat, proteins, and roughage to keep your pets healthy and happy. Charlie chinchilla food from supreme petfoods ltd is a combination of Alfalfa, wheat bites, grass pellets, raisins, peas, maize, soya, and carrots. Charlie chinchilla food is a high fiber diet carefully formulated to provide your chinchillas’ with enough nutrients on a daily basis. The food comes in a variety of sizes, shapes, and textures to help appeal to your chins foraging instincts. The Charlie chinchilla food contains no sunflower seeds or peanuts to avoid giving the chinchillas’ too much fat for their health. This food is nutritionally balanced with tasty natural ingredients with no added sugars. The diet helps promote your chins health and well being. Tiny friends’ farm is another chinchilla food from supreme petfoods that we recommend since it’s nutritionally balanced for the health of your pet. The food is delicious, nutritious with no added sugars and encourages natural foraging for your chinchillas’. Charlie chinchilla tasty mix is a combination of wheat, oats, maize, carrot, peas, Timothy hay and added vitamins that help promote your chinchillas’ vitality and wellbeing. Better still; the food contains added tasty linseed that gives your chins a shiny coat and healthy skin. 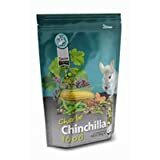 Ensure that your chins get their daily portion of Charlie chinchilla tasty mix plus you can also include fresh leafy greens, or fresh hay and lots of clean drinking water for the health and wellbeing of your pets’. Oxbow essentials chinchilla food is nutritionally balanced to help maintain your pets’ digestive function. The food is also ideal in maintaining your chinchillas’ dental health and weight as well as improving the quality of life for your active herbivores furry friends. 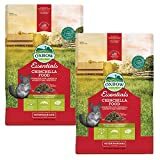 Oxbow essentials chinchilla food is made of good pellet and alfalfa-based ingredients which are high in fiber for your chinchillas’ healthy digestive function. The food is also rich in vitamins, potassium, minerals calcium and irons which to help keep your pets cholesterol in check as well as maintain healthy teeth. Vitakraft chinchilla cocktail is a combination of sweet flowers, fresh fruits, and berries which is a perfect treat for your chinchillas’. Other ingredients include dehydrated alfalfa meal, carob pods, puffed wheat, dried rose hips, raisins, oats, dried rice, ground corn, ash berries, and preservative calcium propionate. The ingredients are all natural to help promote a healthy lifestyle for your chins. This chinchilla food is easy to digest, and it’s blended to imitate chinchillas’ natural habitat. The mixture of real fruits cocktail is colorful and tasty that your furry friends will find it irresistible. This food is formulated to meet your chins nutritional needs to ensure they stay healthy and happy. Naturally, chinchillas are adapted to eating vegetation high in roughage and not fat diets food. The four best foods for your chinchillas’ on our list are rich in high fiber and have plenty of roughage to help keep your chins teeth in good condition and ensure that their digestive system is functioning well. You can also supplement the commercial food with loose hay, but you should ensure it’s clean and fresh to provide your chins with more fiber. Other supplements include apple twigs and branches from non-toxic trees but ensure they are not treated with pesticides. In addition, it is also a great idea to supply your chinchilla chew toys. Chinchillas’ like routine hence the need to be consistent on the time you feed them. You should also throw in some treats for your chins like dried fruit, raisins and rose hips we recommend. For a great cage, also make sure to change bedding often, have a hammock for relaxation and give your chinchilla a dust bath - and make sure to have a wheel for exercise. Important to note though is that most treats are high in sugar hence should not be given to the chins in plenty for their dental health.